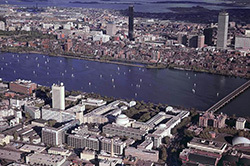 MIT is a coeducational, privately endowed research university in Cambridge, Massachusetts. The Institute has more than 900 faculty and 10,000 undergraduate and graduate students. It is one of the leading research universities in the country, with approximately 2,100 researchers working with faculty and students on projects funded by government, foundations, and industry. MIT's commitment to joining education with the creation of knowledge provides a fertile setting for research that has spawned a host of scientific breakthroughs and technological advances. MIT routinely leads all U.S. universities in patents granted. The largest independent oceanographic institution in the world, WHOI is dedicated to research and higher education at the frontiers of ocean science. 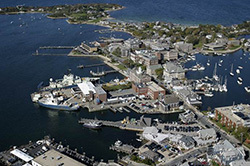 WHOI is located in the small seaside village of Woods Hole, Massachusetts (on Cape Cod), and it is supported by a mix of grants from federal agencies, private contributions, and endowment income. 135 scientists work at WHOI, along with 155 technical staff. WHOI offers scientists 70 years of sea-going experience. It has a fleet of four vessels, the submersible Alvin, remotely operated and autonomous vehicles, and several small surface crafts. Scientists from this Institution and many other research laboratories use these vessels and vehicles for exploration and research in all the basic marine disciplines.